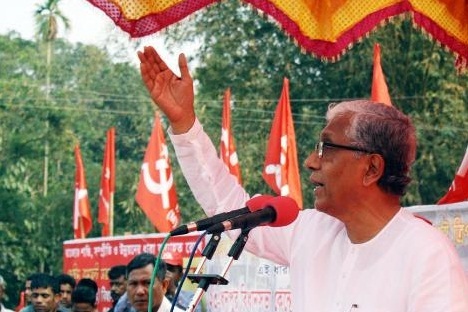 Tripura chief minister Manik Sarkar on Saturdsay slammed BJP for forming alliance with divisive IPFT. The chief minister said IPFT is trying to divide the tribal and non-tribal in the name of Twipraland. He was addressing an election rally in favour of the Left Front candidates at Hejamara, 35 km from capital Agartala. He alleged the PM and his office are directly involved in the conspiracy to divide Tripura as BJP believes in polarizing the people in the name of religion, cast and creed to hide their failure in provide the basic needs of the people. “With them the Minister of the PMO and the home minister had repeated meetings. As the election date has come, no more he could wait and the PM himself held meeting with them. Now the budget session is on and before that they meet the PM with bunch of flowers. Their only demand is Twipraland,” he added. The election for 60 seat Tripura legislative assembly is going to take place on February 18 and counting shall take place March 3.